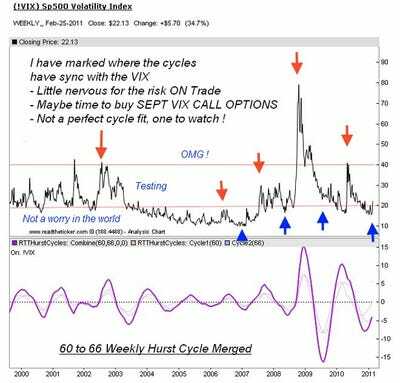 Is The SP500 VIX Index Forecasting A Shaky Stock Market? The cycles on the SP500 VIX Index is ominous. 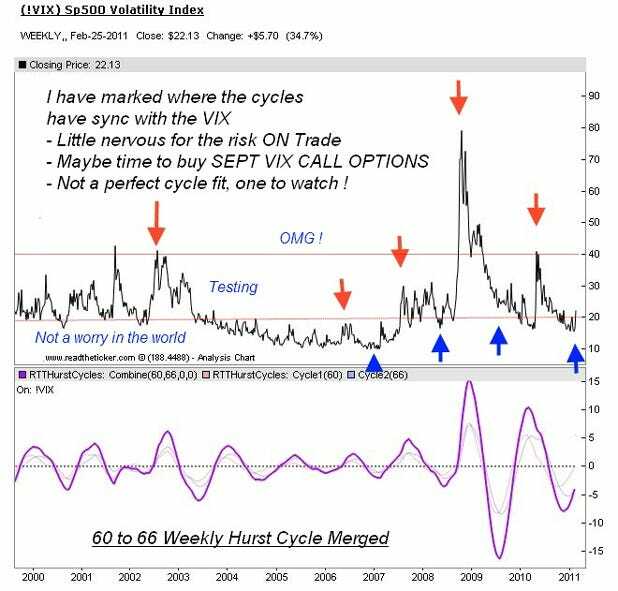 The VIX cycles have a mixed performance, yet recently they look good. Time to wear your hard hat, as things may fall down. I am sure this is good news out there, but this post I am wearing my bearish hat ! Anyways if you want to play the VIX the SP500 is bound to bounce so VIXs CALL prices may be cheaper next week. Also, the 1st of the March is Tuesday next week and I can not recall when we last had a down day on the markets on the first trading day of the month. 1) I didn’t mention QE3 as this is a one eyed bias bearish post. 2) You can learn how we found these cycles from our website.